Rumenco’s dairy hygiene division Progiene, have taken on the distribution of the Uddergold teat dip range. The range consists of UdderGold Platinum, 4XLA and PreGold which are all based on ASC (Acidified Sodium Chlorite) technology, otherwise known as Chlorine dioxide. ASC is a broad spectrum biocide with proven efficacy against environmental and contagious pathogens that can lead to clinical and sub-clinical mastitis infections. “Mastitis treatment and control continues to be one of the largest costs to dairy farmers through costly treatments, discarded milk, a reduction in yields, premature culling and the extra labour required to tend to sick cows. With each case costing an average of £200 per cow, there is significant demand for innovative new management solutions. More so now, with antibiotic resistance concerns leading to an emphasis on prevention measures,” she said. 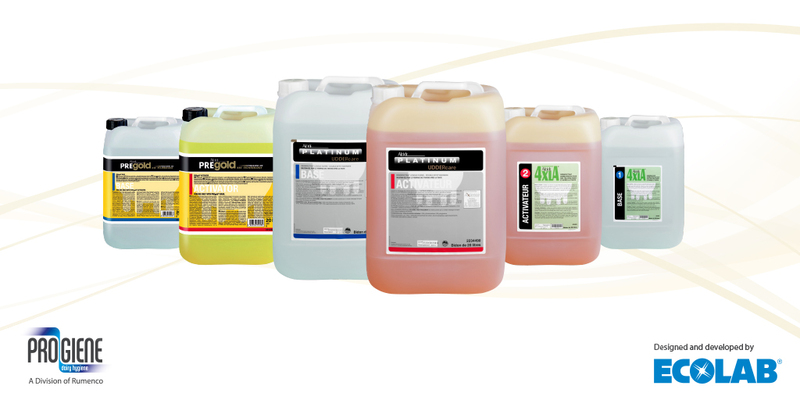 The range of ASC products is manufactured by Ecolab with Progiene having the sole distribution rights in the UK. “This range offers the farmer an increased choice of products with the confidence that UdderGold Platinum is veterinary licensed. The use of effective teat dips form part of a good mastitis management plan and should be part of a proactive approach in reducing infection levels on farm”. Progiene is currently offering a free teat dip cup with each 20 litre pack purchased.